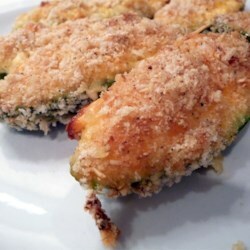 Dip each stuffed jalapeno half into the egg and milk mixture, then roll in corn flake cereal to coat. Arrange in a single layer on the prepared baking sheet. Bake in the preheated oven 30 minutes, or until filling is bubbly and lightly browned.